The bacon wins. Even non-fans of sweet potatoes will be bowled over by the savoury bacon flavour that permeates this simple dish. It’s an easy main dish, a very hearty side dish, or a weekend breakfast option that is destined to triumph over any skeptics you might have in the house. All you need are four simple ingredients. 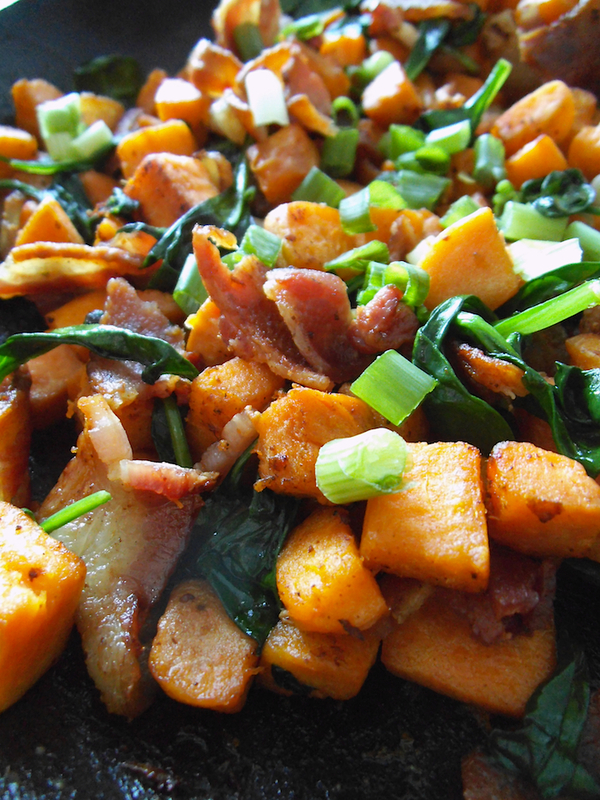 I happened to have bacon, sweet potatoes, spinach, and green onions on hand this week, and so I decided to go for it. Not surprisingly, the whole family loved this skillet! And I think you will too. Just don’t expect leftovers. In a large skillet, cook bacon over medium high heat until mostly crisp. Remove bacon from skillet and let cool. Spoon out some of the bacon drippings until a layer of drippings covers the bottom of the skillet. Reserve any extra drippings for another purpose. Add the sweet potatoes to the skillet and fry over medium heat for 10 to 15 minutes, turning the cubes with a spatula every few minutes. When sweet potatoes are mostly cooked through, add fresh greens. 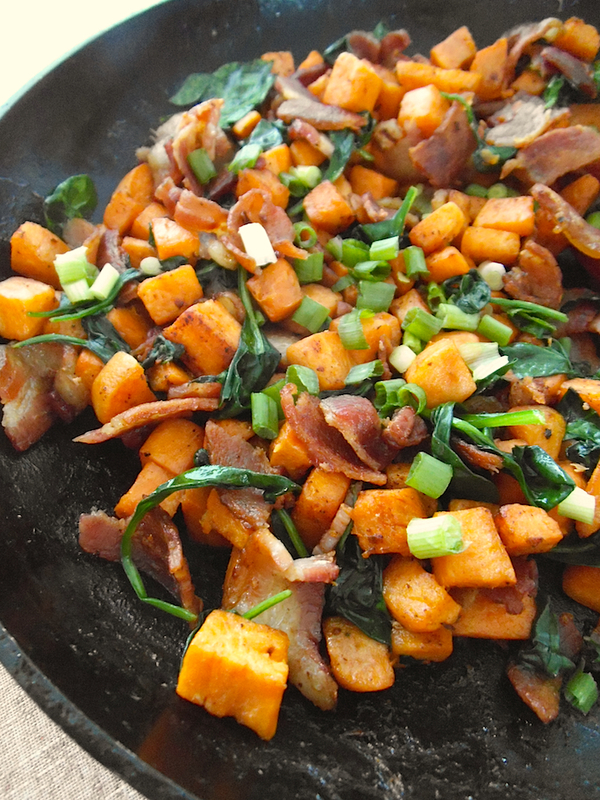 Break up cooled bacon into 1-inch (2-cm) pieces and stir into the skillet with the sweet potatoes and greens. Cook for 2 to 3 minutes, until greens are wilted. Remove skillet from heat and stir in green onions. Serve warm, straight from the skillet if you wish. Also sharing at Natural Family Fridays and Savoring Saturdays. This looks great. My husband doesn’t really care for sweet potatoes but keeps trying them for the health benefit. He may go for this, thanks! Yes, not everyone in my family likes sweet potatoes, but we all LOVED this dish! Looks so yummy! Bacon adds so much flavor! Bring it on! 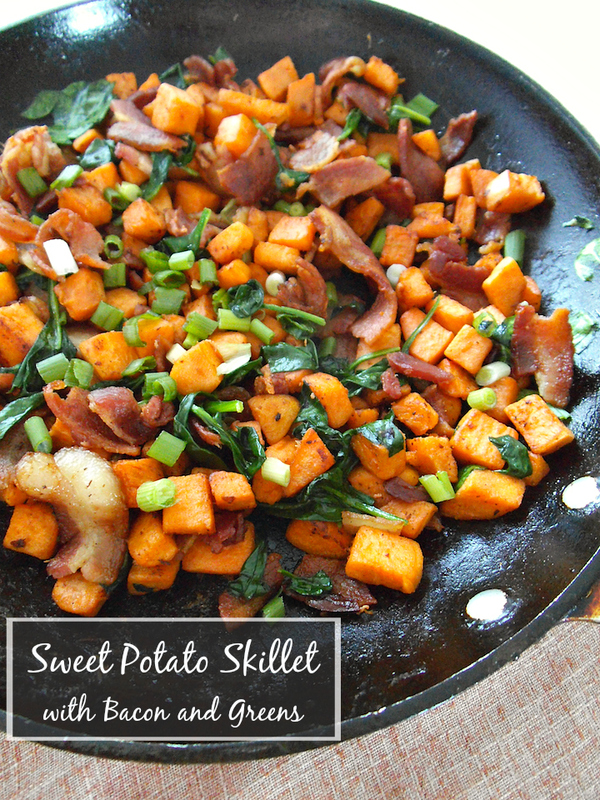 Bacon and sweet potatoes are one of my all time favorite combinations, I’ll bookmark this for later, thank you! Love all the bright colors! Bacon and sweet potatoes, that’s a winner in my book! Sweet and salty, yum! I like the colours too and think it might be good for our St. Patrick’s Day meal. We’re not Irish anyways. I enjoy making sweet potato dishes like this for supper. Never thought of adding greens though. Will have to give it a try. Greens and bacon go so well together too. Enjoy! Yum yum yum! I am making this asap! Great Flavors! Tweeted too! I hope you love it as much as we did! You might need to add a little oil if you’re using turkey bacon since it is lower in fat. Love the ingredients–so fresh, delicious, filling, and inspiring! I know I would lve this…featuring your recipe this week on Allergy Free Wednesday! I was just looking for a recipe for a good quick lunch and this fits the bill. Going to give it a try for sure! Pingback: Turn It Up Tuesday! - Does Your Sister Have Normal Hair? Pingback: Turn It Up Tuesday - #77 - Baby Doodah! This looks lovely – a perfect breakfast dish. A recipe that I can make! Usually I have problems with following recipes because there are so many steps and ingredients, but this one looks simple and absolutely delicious. Thank you! Yes, it’s quite simple once you have the sweet potatoes chopped. Enjoy!